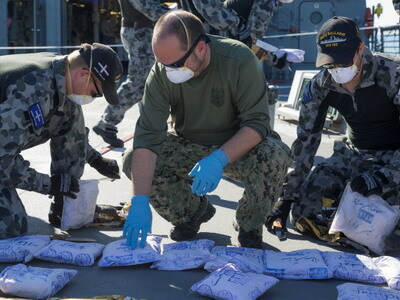 The Royal Australian Navy frigate HMAS Ballarat has seized more than 900 kg of heroin during two boarding operations that took place in international waters of the Northern Arabian Sea under the direction of Combined Task Force (CTF) 150. Combined Maritime Forces (CMF) said the seizures took place on 21 and 23 December. They mark the fifth illegal drug seizure in December for ships operating under CTF 150 command, currently led by the Canadian Armed Forces, with support from the Royal Australian Navy. HMAS Ballarat’s seizures started with flag verification checks on two separate vessels. During subsequent searches, the boarding team discovered and seized illegal narcotics, on both dhows. Approximately 165 kg of heroin was found on the first dhow, and 766 kg of heroin on the second. The drugs were transferred to HMAS Ballarat for disposal. These are the first seizures HMAS Ballarat has made since starting operations in November 2018 in support of Operation MANITOU – the Australian Government’s contribution to support international efforts to promote maritime security, stability and prosperity in the Middle East Region.